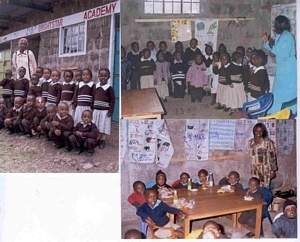 Brightstar Kindergarten serves children from Matasia slums near Ngong. Some of the children at the kindergarten are orphans. Others have come from single parent or child headed households. Children in Kenya slums like Matasia are forced by their next of kin to scavenge, push drugs, or even sell their bodies. The Department of Children's Services, Ministry of Home Affairs, is in charge of protection services for such children who are special need. However, budgetary constraints and lethargy limits what the ministry can do. Brightstar attempts to provide early childhood education and childcare in an environment conducive to the children. It charges them fairly if the children’s guardians can afford it. It also offers free lessons and other services to several orphaned and disadvantaged children. The children are offered education, meals and school uniform. In addition to the usual Kindergarten curriculum, the kindergarten acts as a parent to the children, encourages and teaches them good behavior and courtesy. The kids are also taught hygiene e.g. toilet training, brushing of teeth after meals etc. This school has caring teachers who handle children from the tender age of one and half to six years very well. It is committed to laying a good foundation and helping children to develop and build their self image and self esteem. The classes are divided according to the age of the children. Brightstar Kindergarten is located in Matasia town near Matasia slums or Matasia Police station. Matasai is in Ngong Division, Kajiado District in Rift valley province. It is about 40 minutes drive from Nairobi city centre. The school charges Kshs 500 per month ($7) to the children who can afford it. Others pay Kshs 300 ($4) since they can not afford 500 shillings or are provided with free education and services. •	Lack of stationery – books, pencils, crayons etc. The volunteers work both as teachers and as assistants to the teachers in the classroom. They help in educational activities and organizing of educational and recreational activities for the children (games, art, music, etc). They play with the children during the breaks and participate in the development of curriculum. Brightstar is grateful for the donations received from volunteers. Past volunteers have brought in books, pencils, crayons, toys, balls etc. Others have bought swings and helped in payment of rent. Advance Africa assists the Kindergarten by bringing in volunteers and using part of the program fee received from volunteers as financial aid to the school.